A press copy of Struggle in Three Horn Valley was provided for the purposes of this review. Dinosaurs and D&D are all the rage right now thanks to “Tomb of Annihilation,” the current ongoing story-line and campaign adventure for Dungeons & Dragons Fifth Edition. “Struggle in Three Horn Valley” provides even more lost island dino goodness, beginning with a shipwreck and ending in a full-blown Dino-Riders war zone. 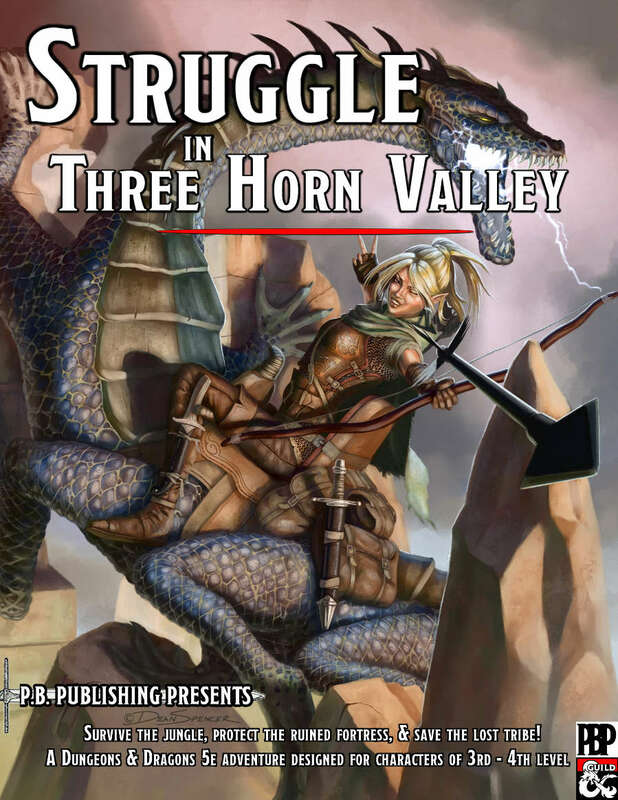 “Struggle in Three Horn Valley” is a lost island adventure designed for a party of 3rd to 4th level characters. It’s about 40 pages long with a suggested play time of six hours. 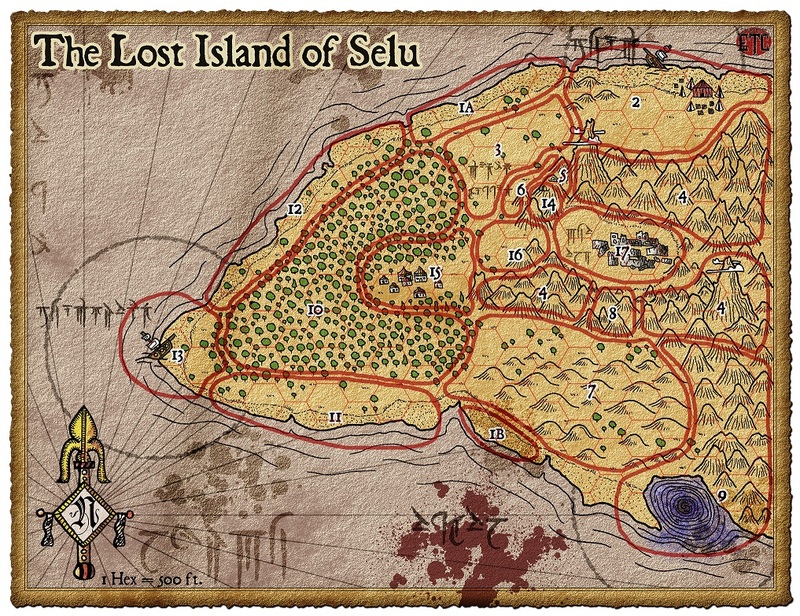 It’s set on an uncharted island called Selu, home to tribal warriors, dinosaurs, lizardfolk, and pirates. The adventure plays out like a classic Ray Harryhausen swashbuckling adventure. Lots of running and screaming in all the best ways. It’s very combat-heavy with little room for role-playing, though exploration and discovery play a major role. The PCs are washed ashore on Selu after a stormy naval fight when pirates attack their ship. This makes it a bit tricky to simply drop this adventure into your current story. Even if you want to use it with “Tomb of Annihilation,” it requires its own separate mini-island, though the PCs do acquire their own ship at the end, allowing them to leave and continue on (or return to) Chult. Alternatively, you could use many of the self-contained encounters here directly in Chult, making the adventure an optional supplement to “Tomb of Annihilation”. The adventure background in Chapter One helps set up the scenario, mostly by detailing the one prominent NPC in the adventure, an elven woman named Raven. Interestingly Raven’s background is given four vastly different options: seasoned ranger, dangerous prisoner, apprentice archaeologist, and nobleman’s daughter. Story-wise the ranger makes the most sense, as Raven appears later in the adventure mounted on a freaking behir! It’s an awesome twist from her being dragged off by the attacking pirate captain during the initial battle. Her badass reappearance may actually be a little too cool – your players should always be the stars. Any lowbie rangers or druids will be wondering if they too will get a chance to befriend and mount a behir. To be fair the behir is never supposed to attack. Still, how does a 2nd level ranger befriend a damn behir? It’s not even a beast! The opening pirate attack scene in Chapter Two is really fun, including giant ballista grappling hooks and hordes of pirates swarming over the ship. The fight can be completely bananas because regardless of how it’s going, a storm will shatter the ship and the PCs wake up on the shores of Selu. At this point the adventure gives the option to split the party into two different starting locations, the north or south side of the island. This could be a really fun challenge but I’m always leery about forcing a party split. The island is relatively small, but full of dangerous encounters. Maybe if you had a large 6-person party you could split them up a bit easier, or as a way to challenge higher level PCs. Thankfully it’s entirely optional, and you could simply choose one of the two starting locations. Selu is designed as a hostile sandbox. Instead of random encounters throughout the island, the area is divided up into 17 different zones, with nearly each zone containing a scripted encounter. I love this approach. It allows the adventure to craft some really memorable scenarios in every area. A triceratops stampede. A pirate encampment. Pteranodons swooping down and carrying off PCs and dropping them in their nest across the island. Velociraptors stalking players through tall grass, Lost World-style. A full-on raptor chase sequence through a valley. An entire mini-dungeon of lizardfolk. There’s a ton of awesome content here, and it’s left completely up to the players and DM on how and when to tackle them. The main events occur when the PCs reach the center of the island and their one safe haven – Paku Village. There they meet up with Raven and a friendly tribe, and learn that the evil pirates who attacked them are here on the island, gathering forces and preparing to attack. The PCs travel east and help defend the ruined fortress, as a pirate leader comes charging in mounted on a triceratops leading pirates and raptors in what looks like an amazingly epic battle that gave me fond memories of one of my favorite old Saturday Morning Cartoons, Dino-Riders. The included maps in this adventure are fantastic for the most part. 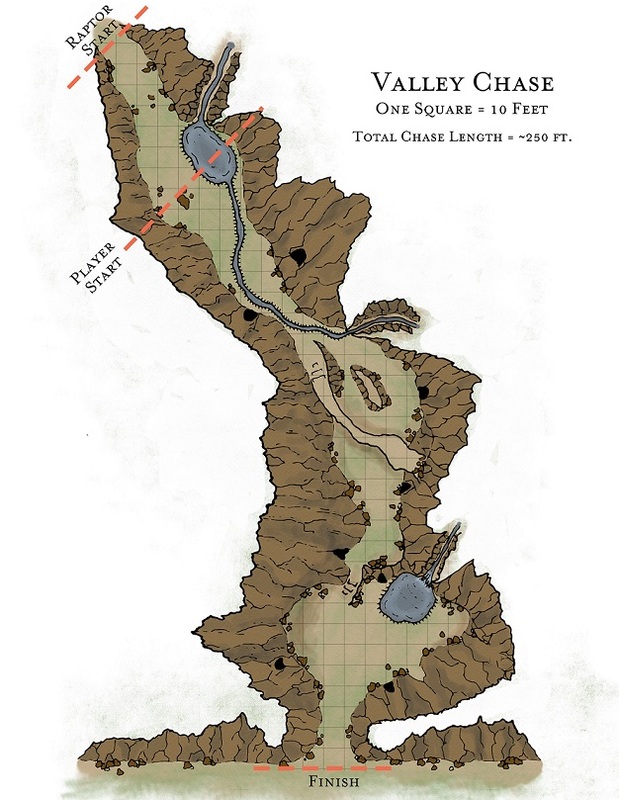 “Struggle in Three Horn Valley” provides seven unique maps, each with multiple formats such as grid/no grid, color/grayscale, and Player/DM. The island map looks great and functions as both a DM resource and Player overland map, while we get useful battle maps for the finale at Nula Ruins, as well the ship battle and lizardfolk dungeon. Unfortunately the ship maps lack color, and the lizardfolk tunnels are done in an isometric style which, while lovely, is difficult to translate to a virtual tabletop. For something like Roll20, you would need to add some random encounter maps for certain areas, as almost every situation leads to combat. The beaches involve fights with pteranodons and hidden gricks, while the jungles include hostile encounters with pirates, raptors, poisonous snakes, and a shambling mound. Most of the enemies are drawn from the Monster Manual, but the adventure does provide relevant statblocks for some variants, such as more powerful CR1 pteranodons, the velociraptors, the unique pirate captains, and Raven. I love the sandbox design of the island and each dangerous encounter feels meaningful and memorable. The opening pirate attack and dino-riding finale are great ways to bookend an island rich with deliciously challenging encounters to throw at your shipwrecked players. A sandbox containing a wealth of self-contained content, many of which could be individually dropped directly into Chult for ToA. Fantastic opening and ending sequences. Many high-quality battle maps in multiple formats. A sequel is planned that expands further into the eastern reaches of Selu, should you want your PCs to stick around. Raven reappearing in the adventure as a powerful ally is great, but she’s a little too impressive and easily capable of showing up any low-level PC. The behir mount is awesome but it’s a bit much – why not a dinosaur? Lots of great maps are provided, but it needs a few more if you prefer using tactical battle maps for each combat encounter.